Because we believe a family is worth the effort. Yes, we could do what everyone else does, but we’d rather give families the freedom to experience a salt water system without the added cost. Create an unparalleled swim experience. Create a silky, natural and swim-safe experience. Buying jugs of liquid chlorine, dumping them in your pool and leaving it for you to monitor and control isn’t what having a pool owner’s back is about. When you have someone’s back you go the extra to make a difference. 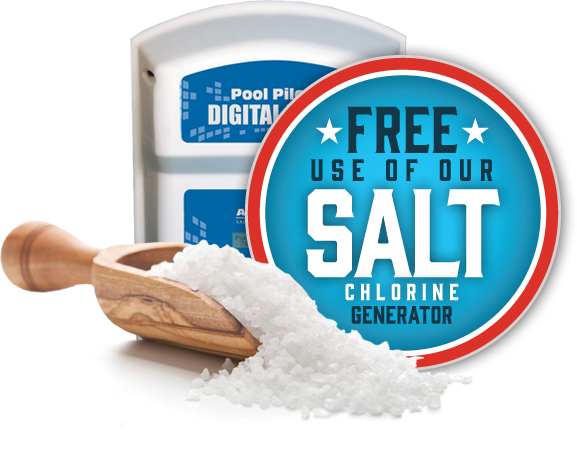 How do you afford your Salt Water Chlorine Generator for such a low cost? We buy our Salt Water Chlorine Generators in bulk from US manufacturers at substantial savings. We’ve been in business since 1952 and currently have thousands of Saltwater Chlorine Generators in service across the country. How do you maintain your Salt Water Systems? We regularly check the system on every visit to ensure optimal performance. If for any reason your system requires maintenance we look after it, or replace it with a new unit if required – at no charge to our customers. If you cancel your Chemical Service, we simply remove our salt system and re-plumb your original system at no additional cost to you.